Whether you go out and dig the clams yourself or buy them at the store, this is a great way to serve them. You can also add a little lemon if you wish. Examine the clamshells, make sure none are cracked, broken or damaged in any way. None of the clams should be opened at all. They need to be alive when cooked. If they are open, that means they are dead and you need to throw them out. They need to be closed tight and kept in a cool place that will allow them to breathe. Before you are ready to cook them, soak them in cold water for about 20 minutes. This allows the clams to breathe and filter the fresh water. Using a stiff brush, scrub the clams well. This will remove any sand that remains, barnacles and other sea "gunk" they may have on them. Heat a large skillet with a cover over medium high heat, melt the butter, add the garlic, wine, water and thyme. Bring to a boil. 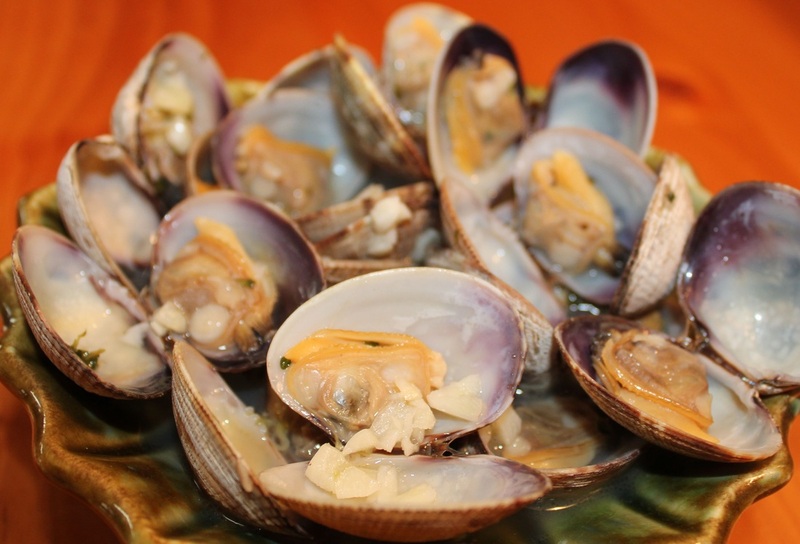 Using a slotted spoon, scoop the clams into the bottom of the skillet. Make sure you don't overcrowd the pan. Cover and steam clams for about 5-6 minutes, don't open the top before then. Spoon the garlic-wine broth over the opened steamed clams before serving.